Kindly supplied by Helen Fowle (later Cook) this is one of a series of im ages of activities both in and out of school in Loftus. 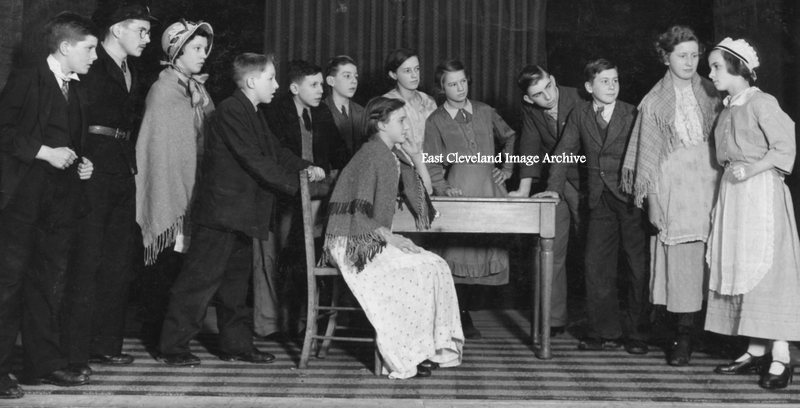 Do you remember taking part in this school play from 1939 and perhaps can assist with the missing names or the title of the play? Standing (left to right): Raymond Lindsay, ? Thompson, Joyce Barrett, Arnold Robinson, ? ?, Dennis Scott, Maggie Holliday, Joyce Linton, Alan Hopper, Dennis Cuthbert, Joyce Wrightson, Audrey Hauxwell. Seated: Irene Wood. Image courtesy of Helen Cooke (nee Fowle) and thanks to Susan for that update.